I have always loved flowers (and gardening generally) and whiled away many a happy summer's day picking wild flowers in meadows and woods near to where I lived in southern Finland. These were then made into bouquets and posies for my mum and grandma; both of whom always seemed very pleased with my efforts. My grandma lived on a farm and I can recall a derelict summer cottage nearby which garden was overgrown with lily of the valley. And yes, I can still smell those huge bouquets I used to gather each year! The hedgerows and woodlands were filled with purple lupins, lacy shepherd's parsley, delicate wood anemones, willow herb and marguerites galore; all just ripe for the picking, while mum grew nasturtiums, marigolds, tulips, geraniums, petunias and cornflowers in our garden. We had several rose bushes too and I used to attempt perfume making each year - albeit unsuccessfully! Because winters are cold and hard in Scandinavia, florists are kept busy with customers wanting to cheer themselves up with some colourful flowers, and my favourite florist was Blomsterhuset - a huge greenhouse-like building complete with a chiller room where all the cut flowers were kept. Such excitement entering that particular room and choosing some exotic blooms. Etiquette demanded that you never went visiting without taking along a bunch, so I was regularly sent along to buy a bouquet or two. Although summer time, I favoured the local market place as many women would be there displaying charming wildflower bouquets created that morning. When I arrived in England in 1981, flowers began to feature less frequently in my life simply because it didn't appear to be the norm to give flowers when visiting; and they were rather pricey too. Happily, since then, the continental tradition has taken root here too and flowers are now readily available here, there and everywhere. In 2008, when I handled my first floral foam brick at a flower arranging course, flower design entered my life big time and boy am I glad it did! And now of course I can't wait to be given the opportunity to create something florally exciting just for you! You may also be interested to learn that in January 2015, I became the Editor of Flora International magazine and spent four wonderful years helping to increase its readership and making so many wonderful floral friends along the way. Having always loved photography and having been a freelance writer since the mid 1990s it was great to be able to put my three passions to good use! And then in late autumn 2018, I was approached by the Belgian Fleur Creatif team and am now also involved with them ensuring their English magazine versions are grammatically correct etc. 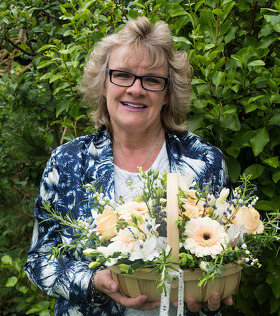 And as of January 2019, I became the Editor of the BFA Magazine (British Florist Association) so floral writing sure is very much to the fore and I relish meeting people from the worldwide flower community be it florists, wholesalers, distributors or consumers. And if you live in the Brighton & Hove area, you may consider coming along to some of my workshops or courses that I run be it at Varndean Adult Education or other venues. And finally, having been a National Trust member for 25 years plus, I was utterly delighted in late summer of 2017 to have been accepted onto the volunteer flower arranging team at Nymans near Handcross in Sussex. I am now regularly asked to help create some beautiful floral displays in the various rooms in the house, together with other like-minded floral folk. What an incredible honour! It would be fair to say that flowers rule my world!